Those who read our earlier review of OlliOlli2 for the Vita already know it’s one of our favorite games of 2015. It now comes to Steam for PC owners to enjoy, complete with extra features that weren’t available when we played it on our handheld screens. One of the reasons we like OlliOlli on the Vita so much is its combination of precise controls and instant and lasting casual appeal. It blends the gameplay style that so many console and gaming handheld owners are fond of, but with the presentation and “I’ll pick it up for one more go” appeal of a mobile/casual game. It’s a mix that’s hard to achieve, and one might wonder how it’ll fare on PC. The answer is – quite well. The developers at Roll7 didn’t just lean back and port the Vita original (which also came out on PS4), they went the extra mile and added new gameplay modes that are very well suited to bigger screens and local multiplayer gaming. 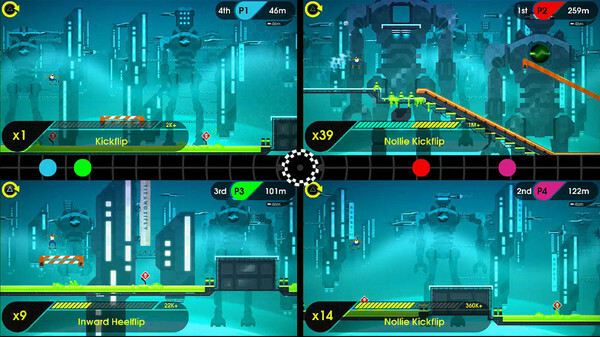 The new Combo-Rush mode is a split screen mode for up to four players (so hooking your pc up to a TV is recommended here), and it turns the existing game into a party mode type of experience. Like the base game – the experience is intense and being able to see where everyone else is just adds to the tension. Of course everything that was in the original release is also still here – you can read our original review here to find out why that’s a good thing. So what we’re left with is a base game that we enjoy a lot, with added content to make things even more fun. The only reason we’re scoring it slightly lower than the Vita version is that the visuals didn’t get much of a boost in the transition to PC. Don’t let that deter you though – this is still a great game to own for gamers who enjoy both Tony Hawk, Line Rider and Super Meat Boy.